Natural history centers, science exhibits, technology displays, zoos, botanical gardens, and out-door programs all provide children fun opportunities to learn. The focus for these 10 activities is about inspiring curiosity, imaginative play, and critical thinking—and there’s no homework. Kids will understand what it’s like to be a scientist here as they also learn about nuclear technol-ogy through a variety of hands-on, interactive exhibits. The exhibits tell the story of the Atomic Age and today’s peaceful use of nuclear technology. Exhibits cover nanotechnology, nuclear medicine and rockets, planes, missiles and cannon. Additionally, camps are available for children ages six to 15 years-old winter, spring and summer breaks and are filled with fun and creative activities that open up the world of science. Go for the day or spend a week as a family at this national education and retreat center and learn about the natural beauty, history, geology, art and paleontology of the region through a visit to the museum or a longer stay for one of the workshops. In 1947, the New Mexico state fossil, the Coelophysis dinosaur, was found right here. Visitors can see huge blocks of dinosaur bones and stand amid life-sized replicas of dinosaurs and even hold 200 million-year-old fossils in their hands. Stop by the Museum of Anthropology for a look at ancient peoples and sign up for the Can You Dig it excavation experience. Summer brings with it Family Week, a week-long series of classes and activities, some geared specifically for children. This is one fun place that makes science fun for kids. Who knew that making a root beer float could teach scientific principles? Make one here and not only do you learn about carbonation, surface area, viscosity and temperature, you also get to drink this sweet treat. Activities include learning about how electricity flows, understanding the differences between liquids and gases, magnet experiments and an entire area just for budding rock hounds. Check out the hands-on activities in the Tech Lab Discovery Room that change throughout the year. The museum’s commitment is to ignite a passion for life-long learning and its children’s programs take that commitment to the extreme. There’s a Naturalist Center where children learn about the state’s natural world through the use of microscopes, touch specimens and nature exhibits. The Camp-In program for children ages six through 11 unlocks the museum after-hours as kids wander the exhibits before settling down for the night. The Young Explorers Summer Camp program focuses on a variety of subjects from space to robots to dinosaurs. The axiom of this museum is that “play is the highest form of research.” Its mission, for children to discover the joys of learning, play and community, supports that through its programs in the arts, sciences and humanities. The learning environment is informal. Classes take place Wednes-day, Thursdays, Fridays and Sundays for toddlers to teens. There are more than 35 interactive indoor and outdoor exhibits and a one-and-a-half-acre outdoor educational garden. The ABQ BioPark is comprised of the 900-animal BioPark Zoo, the 32-acre botanic garden, an aquarium with a 285,000-gallon ocean tank and Tingley Beach, a group of fishing ponds. A day-visit to any of the four areas is filled with informative activities for kids of all ages. Additional programs include Camp BioPark, a series of summer classes; Aquarium overnights, evening events that begin at dusk, spring break camps and preschool programs. This 1.3-mile self-guided walk in the park is an easy trek with children that meanders through the desert environment, an aviary, a 250-million-year-old remnant of an ancient sea, a desert arroyo and a number of animal exhibits that include desert javalenas, a black bear, Mexican gray wolves, tortoises, prairie dogs, mule deer, pronghorns, Rocky Mountain elk, mountain lions and reptiles. Zoo camp for kids in first through six grade happens in July and immerses children in the conservation and ecology of the desert environment through visits to different parts of the zoo. A day spent here is a day that stimulates creativity and curiosity in children of all ages as they make their own discoveries. A superabundance of science, technology, engineering, art and math exhibits fill every inch of the building. The scale of most exhibits is kid-sized with moving parts made for manipulation. 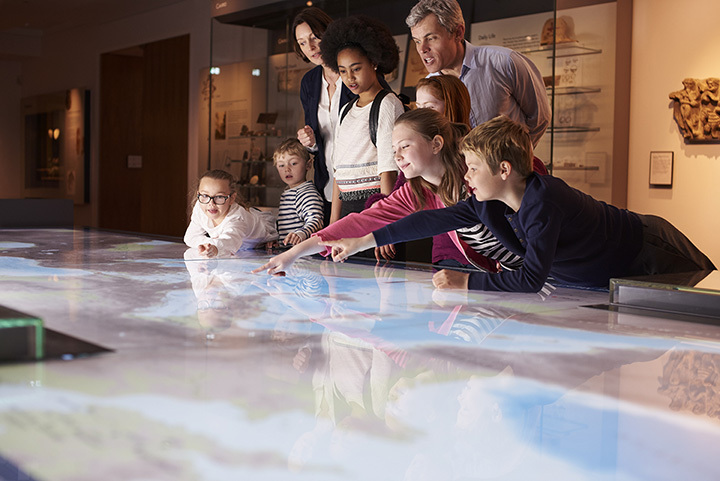 Every exhibit is interactive and designed to engage and stimulate. For those children who might feel overwhelmed, there are sensory friendly resources to help manage the experience. Camps take place on spring and winter breaks and in summer for school-aged children in pre-K through eighth grade. Here, kids will learn about the stars, the desert and ancient fossils. Hands-on exhibits on science and natural history are interspersed with displays featuring live animals and plants from the sur-rounding Chihuahuan Desert. Fossils include pre-dinosaur reptile, amphibian and insect tracks, a captivating look at the past. The orb projector opens up the universe so you can see the sun, moon or planets. Admission is free. Permanent exhibit information is in English and Spanish. This is the home of the famous Smokey the Bear mascot used by the U.S. Forest Service in their efforts, in the 1940s, to promote fire prevention. After a devastating fire in the Capitan Moun-tains about 10 years later, a badly burned bear cub was found and became the real-time Smokey. Exhibits include information on black bears, fire ecology and forest health. A Junior Ranger pro-gram and Little Ranger Program is offered for children ages seven to 12. Upon completion they’ll get a patch, certificate and membership card.